"To promote knowledge and awareness of the life and work of Archbishop Romero." 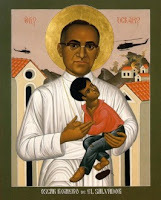 Archbishop Romero is, of course, an inspiring figure. Shot dead while celebrating Mass, he will always be remembered as a champion of the poor and perhaps one day soon he may be elevated to the altars of the Church. Fr John refers to my post Civil Partnerships and the Church II. Practice in which I drew attention to the public celebration of Mr Filochowski's Civil Partnership with his long-standing partner Martin Pendergast. (In Civil Partnerships and the Church I. Theory, I referred to an article by Mgr Gordon Read looking at the canonical implications of the public act of entering a Civil Partnership.) It does seem odd that a high-profile public repudiation of the Church's teaching can be treated by the Church as if it simply did not matter. One of our Bishops is a fellow Trustee so presumably nobody thinks there is a problem. The satisfactory completion of the Diocesan process for the canonisation of Archbishop Romero was accepted by the Congregation for the Causes of Saints in 1998. An investigation was undertaken by the Congregation for the Doctrine of the Faith (under Cardinal Ratzinger) and the nihil obstat was granted in March 2005. At that point the postulator speculated that he could be beatified within six months. A few weeks later, Pope John Paul died and Pope Benedict was elected. He has since made a clear distinction between the processes of beatification and canonisation, (cf. his letter to Cardinal Martins and the Cardinal's subsequent communiqué). The principal effect of this will be the celebration of the beatification will normally be carried out by the Prefect of the Congregation for the Causes of Saints in the diocese that has promoted the cause. This has been characterised as a "tightening up" but it seems rather more like a clarifying of the process. It is unlikely that Romero's cause has been held up unduly and perhaps we will see his beatification before too long.